A spot-on software version of a hardware legend, Mutator does everything its inspiration does... but not a lot more. Creamy, smooth sound. Faithful, endorsed emulation of original. Great for creating stereo effects. Adds subtle colour to many sounds. Edgy filter resonance. No ganged knob offset. Feature set could have been expanded further. Softube's latest plugin emulates a modern classic: the Mutronics Mutator. 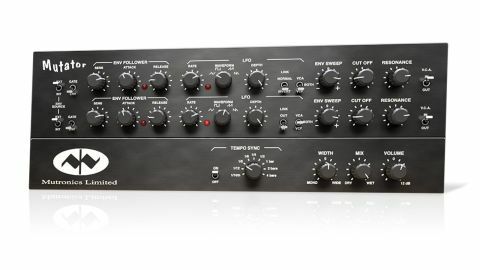 First conceived and manufactured in the 90s and discontinued in 2007, this superb dual channel filter provides awesome-sounding processing of mono or stereo tracks, with onboard LFO and envelope modulation opening up real creative potential. Each of the two channels consists of a 24dB/ octave resonant low-pass filter with dedicated envelope follower, LFO and output amplifier (VCA). The envelope controls comprise Attack, Release and input signal Sensitivity, while the LFOs offer adjustment of Rate, Depth and Waveform (Triangle, Square, Ramp Up, Ramp Down). The Filter section itself houses knobs for Cutoff frequency, Resonance and Envelope Sweep amount (positive or negative). "The Mutator filter is renowned for its silky-smooth sound and responsive envelope, both of which are perfectly captured here"
The Envelope Follower controls both the VCA and filter Cutoff via the Envelope Sweep control. It can be set to follow the amplitude of the main input or an external sidechain keying signal, or switched entirely to a simpler on/off Gate mode, with the Sensitivity control setting the threshold. Each LFO includes a three-way switch for assigning it to the filter, amplifier or both, while the top LFO can be made to work on both channels with a click of the Link switch. To the right of the Filter section is a switch that completely bypasses the VCA, sending the post- VCF signal straight to the output. Feature-wise, Softube's emulation is totally true to the original, with the exception of the extra panel at the bottom that adds LFO Tempo Sync (from 1/16 to 4 bars), dry/wet Mix, output Volume and the mid/side-balancing Width control. Also, knob parameters are displayed in the bottom left corner, giving precise values for Envelope Attack (1-500ms), Release (1-2000ms), LFO Rate (0.03-30Hz) and filter Cutoff (42Hz-22kHz), while holding down the Shift key gangs both channels - albeit without retaining their relative offsets, alas. The Mutator filter is renowned for its silky-smooth sound and responsive envelope, both of which are perfectly captured here. On rhythmic guitar or bass parts, for example, it can add subtle emphasis. The same trick can be applied to drum and percussion loops, synths and electric pianos, along with the inverted panning tricks discussed in The missing link. Combine this with the tempo-synced LFO, Mix blend and Width controls, and you have a classy processor that adds subtle tonal and spatial enhancement not easily achieved any other way. However, it can also totally transform sounds at deeper envelope settings and higher filter resonance. Indeed, the resonance is noteworthy in that it has real bite but never feels out of control, even when self-oscillating. There's also plenty of mileage to be had using one sound as an external envelope source for filtering another. On the downside, we feel that Softube could have added further enhancements such as serial filter operation and more complex signal routing, and functional extras such as retaining that aforementioned offset when ganging controls. Nevertheless, this is still a fantastic, highly successful emulation of a hardware classic.